The Stones guitarist's 1988 solo debut will be available in various formats, including a lavish box set. 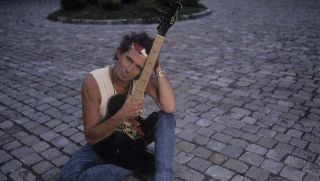 Keef revisits the first song he ever learned on the guitar. Two blues guitar greats let loose on a Howlin' Wolf classic. The new set is fully remastered, with additional artwork and a rare 1968 Japanese promotional interview with Mick Jagger. The film captures the band onstage in Miami in 1994. Robert Plant, Pete Townshend, Duane Eddy and more also signed the handcrafted guitar, which was modeled after Buddy Holly's beloved Gibson J-45. In a new article, Total Guitar counted down the 10 wealthiest guitar players in the magazine’s home country, the U.K. Hear Keith Richards' Isolated Guitar from "Gimme Shelter"
The Rolling Stones have announced On Air, a compilation of recordings from various BBC performances from 1963 to 1965. Eagle Rock Entertainment has unveiled The Rolling Stones’ From The Vault: Sticky Fingers Live At The Fonda Theatre 2015 on DVD+CD, Blu-ray+CD, DVD+3LP, and digital formats.